This article is about the fourth area of Donkey Kong. For the first world in Donkey Kong Country Returns, see Jungle (Donkey Kong Country Returns). 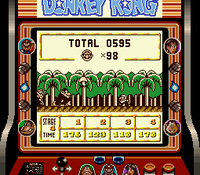 The Jungle is the fourth world of the game Donkey Kong for the Game Boy. The Ship docks on the shore margining the Jungle, and Donkey Kong sees this as an occasion to liberate himself with Pauline in his arms from the pursuit of Mario. The Jungle builds up on all gameplay elements previously found in the Forest. It is inhabited by Monkikki, capuchin-like helper animals that lumber on high platforms; they have long tails which hang down, and on which Mario can grasp and use as ropes to pass wide chasms while the Monkikki is moving. Frogs called Jumpers, are present in some levels of the Jungle, also quite aid Mario in progressing. They help him reach higher places while he carries the Key. Donkey Kong Jr. also makes a debut here, and this time, his role is that of flipping switches which activate and deactivate bridges and throwing Poison Mushrooms at Mario, which make him shrink and lose his abilities for a short amount of time. The Jungle has 12 stages. This page was last edited on April 13, 2019, at 10:22.